One of the most beloved and captivating musicals in Hollywood history, “West Side Story” will return to movie theaters for two days only this June as Fathom Events and Turner Classic Moviesexpand the yearlong TCM Big Screen Classics series, which brings legendary motion pictures back to cinemas across the country every month. Further enhancing this big-screen presentation, TCM Primetime Host Ben Mankiewicz will introduce the film and present post-show commentary. Tickets for “West Side Story” will be available beginning April 20 at FathomEvents.com andparticipating theater box offices. 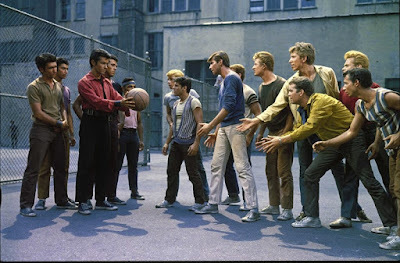 From Fathom Events, TCM, Park Circus and Metro Goldwyn Mayer (MGM), “West Side Story” will be presented in more than 600 movie theaters on June 24, and June 27, at 2:00 p.m. and 7:00 p.m. local time each day. A complete list of theater locations is available now on the Fathom Events Website (theaters and participants are subject to change). Presented in its original widescreen aspect ratio, and complete with its original mid-film intermission, “West Side Story” combines a majestic score by Leonard Bernstein with the lyrics of Stephen Sondheim. The movie waslargely shot in New York City – on what is now the Lincoln Center complex – by co-directors Robert Wise and Jerome Robbins, both of whom received the Oscar® as Best Director. Visually inventive and emotionally resonant, “West Side Story” is the tale of two warring New York City gangs – the Jets and the Sharks – and the ill-fated love story that springs up in their midst. The film stars Natalie Wood as Maria, Richard Beymer as her boyfriend Tony, Rita Moreno as Maria’s sister Anita, and George Chakiris as Bernardo. Both Moreno and Chakiris received Oscars® for their indelible work in supporting roles. By blending realistic settings, stylized choreography, an extraordinary cast of performers and an unforgettable score, “West Side Story” became a cinematic and cultural sensation when it was released in October 1961, grossing $43 million at the box office – equivalent to $500 million in today’s dollars. Its soundtrack, including “Tonight,” “I Feel Pretty,” “America,” “Something’s Coming” and “Somewhere,” has become one of the most iconic in movies history. Fathom Events is the leading event cinema distributor with participating theaters in all 100 of the top Designated Market Areas®, and ranks as one of the largest overall distributors of content to movie theaters. Owned by AMC Entertainment Inc. (NYSE: AMC), Cinemark Holdings, Inc. (NYSE: CNK) and Regal Entertainment Group (NYSE: RGC) (known collectively as AC JV, LLC), Fathom Events offers a variety of one-of-a-kind entertainment events in theaters such as live performances of the Metropolitan Opera, top stage productions including Newsies! The Broadway Musical and George Takei’s Allegiance, major sporting events such as Mayweather vs. McGregor, epic concerts with artists like Lady Antebellum and Sammy Hagar, the yearlong TCM Big Screen Classics series, inspirational events such as Is Genesis History? and IN OUR HANDS: The Battle for Jerusalem, and beloved anime titles like Princess Mononoke and Spirited Away. Fathom Events takes audiences behind the scenes for unique extras including audience Q&As, backstage footage and interviews with cast and crew, creating the ultimate VIP experience. Fathom Events’ live digital broadcast network (“DBN”) is the largest cinema broadcast network in North America, bringing live and pre-recorded events to 912 locations and 1,427 screens in 181 DMAs. For more information, visit fathomevents.com. Turner Classic Movies (TCM) is a two-time Peabody Award-winning network that presents great films, uncut and commercial-free, from the largest film libraries in the world highlighting the entire spectrum of film history. TCM features the insights from Primetime host Ben Mankiewicz and Saturday daytime host Tiffany Vazquez, plus interviews with a wide range of special guests and serves as the ultimate movie lover destination. Currently in its 23rd year as a leading authority in classic film, TCM offers critically acclaimed series like The Essentials, along with annual programming events like 31 Days of Oscar® in February and Summer Under the Stars in August. TCM also directly connects with movie fans through events as the annual TCM Classic Film Festival in Hollywood, the TCM Big Screen Classics series in partnership with Fathom Events, as well as through the TCM Classic Film Tour in New York City and Los Angeles. In addition, TCM produces a wide range of media about classic film, including books and DVDs, and hosts a wealth of material online at  tcm.com  and through the Watch TCM mobile app. Metro Goldwyn Mayer (MGM) is a leading entertainment company focused on the production and global distribution of film and television content across all platforms. The company owns one of the world’s deepest libraries of premium film and television content as well as the premium pay television network EPIX, which is available throughout the U.S. via cable, satellite, telco and digital distributors. In addition, MGM has investments in numerous other television channels, digital platforms and interactive ventures and is producing premium short-form content for distribution. For more information, visit mgm.com.